Specially designed for Rousettus® and made from recycled materials, VIYM® Carry Bags are available in green or black. 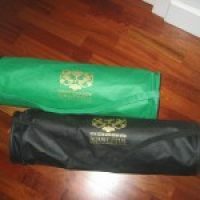 Measuring 26" by 7.5", the bags are large enough to fit a rolled VIYM® mat and other items, such as a water bottle, towel, or an extra t-shirt. Each bag is accented with the Rousettus® logo in gold.